It may seem like buying new tech for your sales team can solve many of the problems your sales team is facing. Faster follow-ups, better data, improved demos, and faster proposal delivery are all very good things – don’t get me wrong. But often times, companies are missing the fundamentals and are skipping those basics. Instead, they end up replacing some of the most important steps with the addition of tech. In a recent article on Sales Hacker, Max Altschuler says the first thing you need to do is understand the process from a bird’s-eye view. “A sales process is a repeatable and scalable system in which you engage and facilitate potential buyers through the stages of your pipeline. This runs from the top of the funnel (the lead) down to the closed deal and handoff to the Customer Success rep, after the buyer has signed the contract,” Altschuler writes. When evaluating your current sales stack and desired sales stack, you may want to ask yourself: What are the stages of the pipeline that matter most to you? What are the milestones you’d like to hit along the way? Don’t make too many stages as it can get confusing when you scale. The larger your company and more complex your product, it’s likely your sales process will be longer and more rigorous. The smaller your company and more niche your product, it’s probable that your sales process will be condensed (which is a very good thing!). Regardless of your plans for how you will create more efficiency and effectiveness with your sales stack, you must first step back and spend time with members of your sales team and sales management. How is your team setting up meetings? How are demos being performed? How does the proposal process currently work? Who is meeting quota – why? Who isn’t meeting quota – why? And perhaps the most important question to ask: How much activity are your reps able to produce, and how efficient and effective are they in their daily roles? As explained in a previous blog post, a study by The Bridge Group respondents said that mastering tools and technology was a top challenge. But this tells us that almost half of B2B companies are now having difficulty with productivity and performance. What’s more, 24% of B2B companies are struggling with forecasting accuracy; 16% have trouble with metrics and reporting; and only 10% named technology and enablement tools as a primary challenge. What is most important to your company and to your sales team specifically? Beginning with the lead generation process all the way through the renewal process, where does your team excel? Does your sales development team rock at setting up demos? Does your account management or customer success team do an incredible job maintaining solid relationships with clients that results in a strong renewal rate? On the contrary, where does your team fall short? Are your conversions from demo to opportunity weak? What about the activity level and number of outbound calls or emails your sales team sends? Examining your current metrics and KPIs and then comparing those with your overall sales team goals is a fundamental many companies miss. It’s easy to assume your sales managers are keeping an eye on specific KPIs, but that isn’t enough. Executives across the company should know these KPIs and performance inside out. Modern sales leaders live in a world of constant content marketing. Everywhere we look, we see other companies we admire selecting new technologies, innovating on current processes, and exceed their targets. It’s easy to get caught up in this trend of constant tech innovation because we hear them being referenced by other companies. But beware – often times the continual addition of new technology becomes distracting for sales reps. If they’re constantly being asked to change their process or begin using a new tool, you could be jeopardizing your entire sales process – and spending a lot more in the process. Some people think there’s a perfect sales stack, but every company operates very differently. 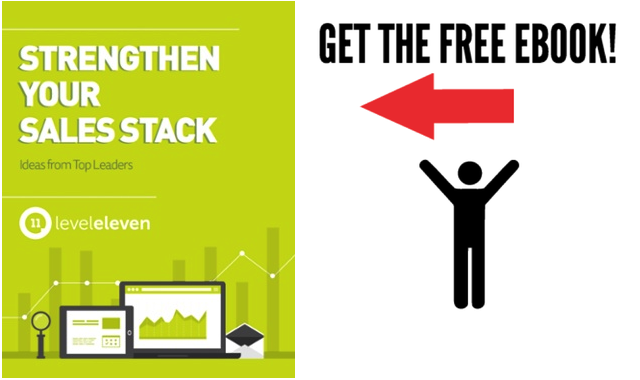 Even your direct competitors could have a drastically different sales stack. According to TOPO, on average, high-growth sales development teams have 5 applications in their technology stack. In a another blog post, we caution to try not to make quick or rash buying decisions based on what your competitors use. And stay away from choosing technologies simply because they are the newest, shiniest or coolest on the market. Ask yourself what you want to see your salespeople doing every day, and then figure out which technologies will help them do that. Do plenty of research on what’s available, and definitely test out the tools that seem to fit with your needs. Sales stacks do not run on autopilot. No matter how much research went into the buying of your new sales technologies or how well engineered your new processes may be, problems may arise (whether obvious or not) along the way. You may have turnover on your sales team, you may have a gangbuster quarter, or you may have some external pressures from competitors. Whatever the circumstances, re-evaluation is imperative to understand what’s working and what’s not in your sales organization. Remember those KPIs you defined? Remember that research you did early on? Keep asking and keep defining and measuring. If your team’s KPIs are off, or if you are behind or ahead, you’ll need to keep optimizing your process – it will never be perfect. There are many incredible sales technologies that exists today and the industry needs them. Just make sure that your tech is enabling the fundamentals. In a world where new technologies are being thrown at us every day, don’t forget the basics. Buying new tech for your sales team can't solve all of your problems. Understand these 4 fundamentals to build an ideal sales stack.